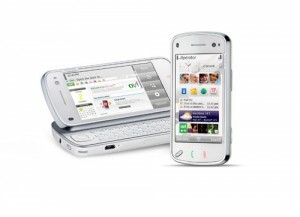 When Lilia Martinez-Coburn, my colleague at hi5, first told me about the upcoming Nokia N97, I was skeptical. I’ll eat my words today. Cinematic UX – Finally, someone has successfully xeroxed Apple’s Core Animation’s GPU + implicit animation model and who better than Nokia. The implicit animation model is key in making great UX with minimal pain and bugs. I suspect the UX polish is focused on the main “phone top” idle screen, but it’s a great showing. Web Browser – It’s WebKit and Nokia already has a decent port. Industrial design – N97′s form factor is great. Nokia is no slouch when it comes to ID, and they’re very close here. N97′s a fair amount thicker, but not too shabby. A twist – a physical keyboard and Flash + video support. Apple’s mobile web efforts have promise, but people sure do ask for Flash a lot. Performance – Touch interfaces need to have minimal to no latency. Graphics needs to be fast, and I have no doubt a GPU is sitting in that N97. Hopefully S60 5th Edition is up to speed here. Nokia Maps? – Well, I’m certainly skeptical of Nokia’s ability to out innovate Google on mapping technology, but I wish them the best of luck. Competition is always good, and I hope Nokia finds the game changer in building their own mapping service. I have two closing thoughts for now – 1) MacWorld is in January. I can’t wait to see that Apple tablet. 2) Finally, a new “internet communicator” with potential… though it hasn’t shipped yet. 2009 is going to be an interesting year. This entry was posted on Tuesday, December 2nd, 2008 at 1:45 am	and is filed under Life, Technology. You can follow any responses to this entry through the RSS 2.0 feed. Both comments and pings are currently closed. there maybe new phones these days but the Nokia N97 is still one of the best phones. ;.